What's the deal with NASCAR hot dogs? We’re not setting this up like some hackneyed comedy bit—hey, what’s the deal with airport security lines, amiright?—but we Tofurky-sucking snowflakes genuinely want to know: Are NASCAR racetrack hot dogs amazing? We’re fans of finding encased meat love in hopeless places. The Costco food court, notably, serves our favorite $1.50 hot dog (fight us about this). As frankfurter enthusiasts, we were stricken to find out that, perhaps, a delicious, $2 chili dog has been under our radars and under our noses this whole time: the NASCAR racetrack hot dog. 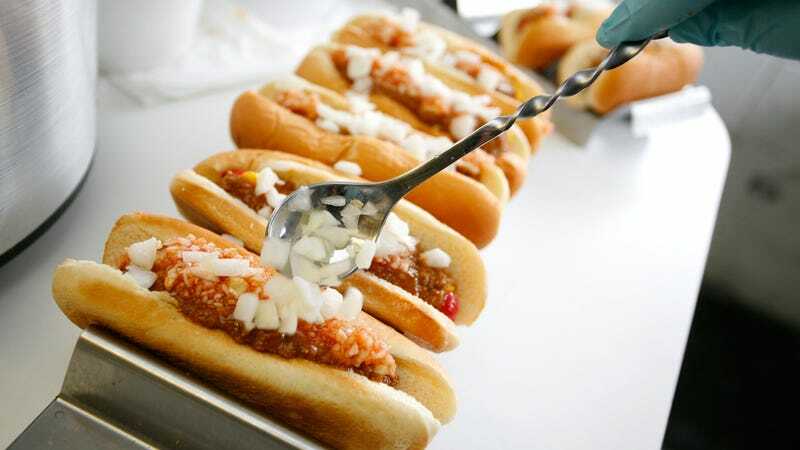 It came to our attention via USA Today’s report that the Nascar Martinsville Speeedway in Ridgeway, Virginia, site of two annual NASCAR races, will bring back longtime hot dog supplier Jesse Jones hot dogs. A few years ago, NASCAR swapped Jesse Jones dogs for Valleydale Hot Dogs, a subsidiary of Smithfield Foods, NBC News reported, and fans did not take the news lightly. For three years, they’ve pined and asked and begged for beloved Jesse Jones’ return, and finally NASCAR heard their cries. “Our fans have told us they wanted Jesse Jones back and we have listened,” Martinsville Speedway president Clay Campbell told USA Today. Yes, the beloved dogs are back, and there is much rejoicing. Now that we’ve come to the harsh realization that there are, in fact, people more versed in delicious, <$5 hot dogs than us, we ask for your help: What makes these Martinsville Speedway dogs so scrumptious? Do we need to book tickets to Virginia immediately? And what other cheap hot dog wonderlands are still out there waiting for us to discover them? What would you eat on $30 a month? Ask The Salty Waitress: What can I do when my friends behave like knuckleheads?